A few weeks ago I got the idea to write an essay about myself as a balloon. I put it off, and I find I am no longer able to do so. I had been tied firmly to my moorings and, despite dancing in breezes and being bullied by gales, I was confident that I’d hold fast. Popping was out of the question. My sense of security had made me a regular punch ball. Thus grounded, I had even forgotten I was a balloon. I had continued in this state for decades without a second thought. I was so accustomed to my attachment that I no longer contemplated it. My connection to Hanna had become like breathing, I suppose. It was necessary for life, and yet it went on largely outside my conscious awareness–until a disruption of my normal rhythm reminded me I was doing it at all. After an unsettling fall in which Hanna did not return my communications, I became keenly aware of my tie to her, my umbilical cord. Undernourished, my robust skin began to dull and thin. I began to feel deflated, and I wondered how much longer the silence would continue. Hanna’s January letter cut me loose. I bounced and skidded across the ground as the moaning wind compelled me across the gray winter landscape to an uncertain fate. Fragile, I was in danger of puncture. Sharp pebbles and brittle grasses clawed at my sides. For nearly two months, it was all I could do to keep myself intact. Sometime in March, the winds started to abate. Spring seemed possible. The sun reemerged and began to warm me with its golden rays. I felt myself growing stronger. The beams whispered love to me. I ate and drank them. I began to grow fat and round once more, my skin taut and strong and shiny. Yes, Spring was on the move. Warmth curled itself around me and within me, and I began to rise in fits and starts. Unattached, I couldn’t stop myself. And as I got over my fear, I began to enjoy my new perspective. I was no longer safely tethered, it was true. But my uncertainty was eclipsed by a burgeoning joy at this unexpected freedom. I wanted to say all that–but I can’t. (Here you have to imagine the sudden ripping of a phonograph needle across a vinyl record.) I can’t write all that because just as the balloon was beginning its steady rise, a second letter came. Hanna stated it had not been her intention to end the friendship but merely to put it on hold. At that exact moment, the balloon snagged in the branches of a tree. It is stuck there still. The balloon is unable to continue its ascent until a further shift of the wind releases it. Meanwhile, the string dangles within reach, leaving open the possibility of its recapture. What comes next is up in the air. So you see, I am unable to write about myself as a balloon. This excerpt is part of The Story of Hanna. For the prior installment, click here. For the next installment, click here. Posted in creative nonfiction, memoir, personal essay and tagged balloon, deflation, depression, family rules, freedom, friendship, grief, hope, joy, letting go, limbo, loss, recovery, relationship, restoration, sadness, The Story of Hanna, uncertainty. Bookmark the permalink. I’ll say this very carefully, because it might not be at all true for you and Hannah. Remember when I wrote that I understood because our family had gone through a very similar situation, and when push came to shove, I realized it was more important to put my family first and protect them than continue to give CPR to the friendship. I, too. received a similar letter sometime later: “I meant to give our friendship a break, never did I intend to end it” were the exact words. What I realized and accepted then was that friendships taking “breaks” are on the same downward spiral as marriages taking “breathers”—not a good sign, not even an honest situation–and sometimes the only healthy and personally honest thing to do is cut the ties and let your life as a balloon catch a second wind and learn to soar under its own volition. Whatever you do, I wish you well. I used to think about it all the time but then I gave up. I got too stuck. A lot of me agrees with you that the rupture was too large and any relationship which would come next would be an entirely different animal and possibly not worth the huge effort it would require. I have become a different person, and I am living a different life as a result of the trauma, and I find I am healthier. On the other hand, I hold my Christian beliefs about forgiveness and reconciliation. (Which is not to say that things ever could or should resume where they left off!) So I will deal with it if the opportunity arises. And you would be correct in taking from this that it has not. That letter came 3.5 years ago…. What Marylin said….because I can’t say it better. 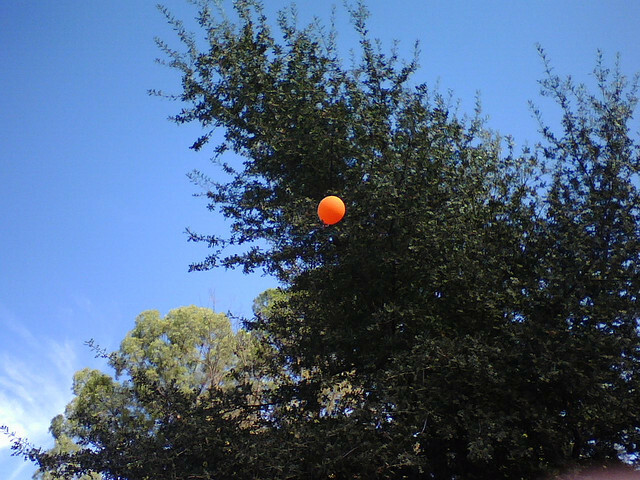 I can sense the balloon stuck in the tree, neither grounded or free to soar. If something lies at the end of the wait, it will be new, based on new rules and coming from new places of being. When you are ready, free the balloon and see where it takes you. Yes. There is much wisdom in her words. I replied to her. Do you mind reading that reply so I do not have to re type it? Sounds terribly painful . hope you have found your way out of the most painful part. And you seem to be extremely loyal. You do conjure up a very apt and deeply emotional image with the balloon. Clever writing. Thank you, Mogromo–for the empathy and the words about the image. That letter was 3.5 years ago, and I am doing well. Now. On my post about following footsteps you commented that the photo looked like a drawing your mother has . Funny thing is I was walking along a similar Waldweg with family yesterday and I came across a clearing. A lone tree stood in the center with a single red dot in its crown. And yes it was a red balloon. There is some synchronicity going on here….. I took a photograph, but cannot upload from this location. That is so…well, I cannot think of the right word. Interesting doesn’t quite do it. I am so curious! So cooooool. Now I have to take a photo of Waldweg next time I visit my mom.